A few more things have officially been checked off the to-do list for the bathroom. 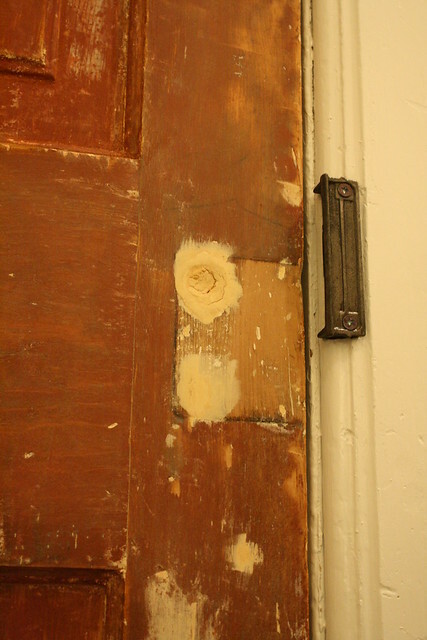 The door casing is re-installed and painted, the door is hung and painted, and the original hardware is back in action! Neither the trim or door is perfect, and there are cracks and gaps that could use some caulk, but for now it's a gazillion times better than it was before. First up was re-installing the catch. No problems there. 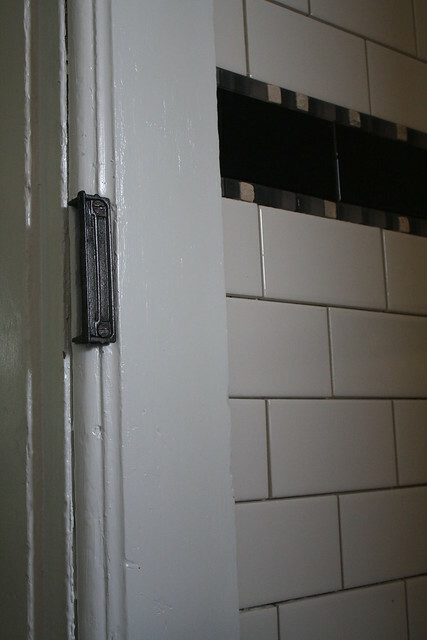 To re-hang the door, I had to use this tip involving toothpicks from Old Town Home. I don't have any pictures, because I used coloured toothpicks and it honestly looked ridiculous. I also had to fill in the original hardware holes and drill new ones. Seeing the threads from the handcranked drill disappear as I smooshed in wood putty was hard - it was one more link to our house's history and the era it was built. But, things were really out of whack; it was unavoidable. I decided to drill my new holes before painting (as an aside, I realize that the wood filler job is NOT ideal, but the rimlock would be covering it up so I didn't bother making it perfect). To make sure I had every thing lined up, I held up the rimlock next to the catch, and traced around it. I also stuck a pen through the screw holes to mark where I would have to drill some pilot holes. I also had to drill two holes right through the door. One for the door knob spindle and one for the key hole (which isn't done correctly since we don't even have a skeleton key for this lock). 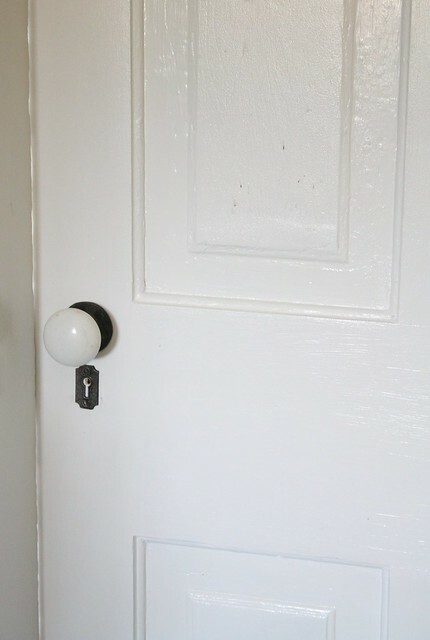 We didn't have a drill bit big enough for the hole for the spindle so it took some creative drilling, but I managed to get it done without ruining the door. After a coat of primer and two coats of paint, I was able to attach the rimlock. 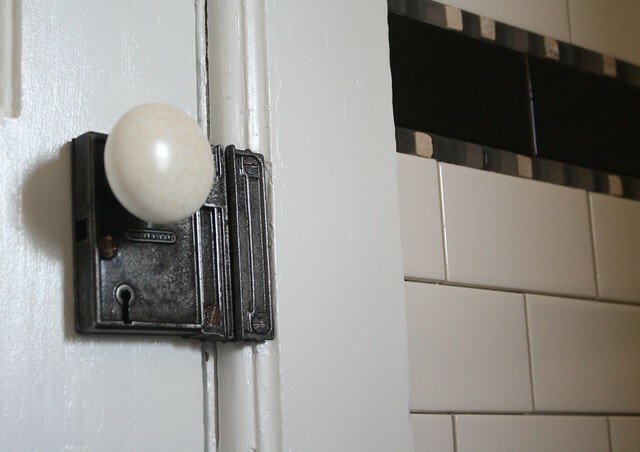 We have a working doorknob on the bathroom for the first time in almost a year! 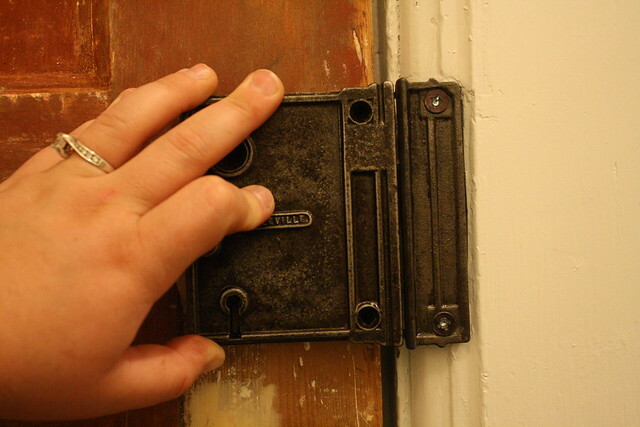 You can see how I rehabbed the hardware back in January here (I removed it from the door long before that, though). We're getting to the finish line, hooray! I hope everyone had a good Labour Day weekend!